Tom Earnhardt is a native North Carolinian who began fishing shortly after he was born in 1945. Tom says he simply cannot remember any period of his life when he didn’t fish. He received his first vise on this ninth birthday. Since much of his first 20 years was spent in the mountains near Asheville, trout and smallmouth were his first loves among fish. Since 1970 he has become an avid saltwater fly rodder. His largest tarpon on a fly was 170 and his largest redfish over 40. From his home base in Raleigh he has fished around the world---much of Europe, Canada, the Caribbean, New Zealand, China, and Russia (seven trips). His favorite waters, however, remain Appalachian streams, the Chesapeake, and the Outer Banks. In real life Tom is an attorney, writer and former full professor of law with over 20 years of teaching experience. He has written two books (Fly Fishing the Tidewaters and Boats for Fishermen) and is completing another. He has authored numerous magazine articles, and he has appeared on a variety of television shows. Tom’s writing and speaking schedule has been slowed a bit in recent years for two good reasons, Izaak, age 11, and Rachel, age 8. Tom, his wife Dana Jennings and children live in Raleigh, but spend much time at their house on Harkers Island. 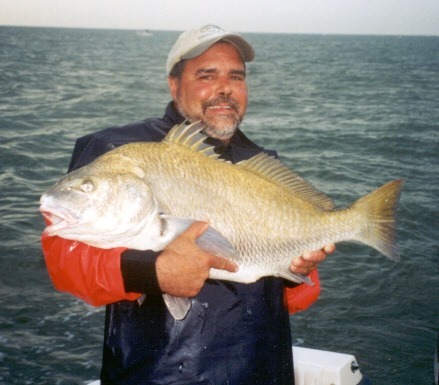 It was at Harkers Island that he began popularizing fly fishing for false albacore in the early 1990’s.